Forget viruses - Today’s threats come in new shapes and are called Malware That's why we think "Anti-Malware" is the more appropriate term, even if it's the same as what's commonly known as "Anti-Virus". Destroys annoying Adware - one at a time In Internet security, “PUP” stands for “Potentially Unwanted Program”. These are unneeded browser toolbars, adware and other annoying software that typically gets installed with freeware software downloads. In a nutshell, what can Emsisoft Anti-Malware do for your business? Many freeware programs install unwanted software, such as browser toolbars that modify your search provider and homepage. Others add unwanted advertising while surfing. Emsisoft Anti-Malware specializes in finding and removing such PUPs safely and efficiently. Emsisoft Anti-Malware is provided with new detection signatures at least 24 times a day, ensuring the best protection possible. Your workstation’s power belongs to your business, not to your antivirus. 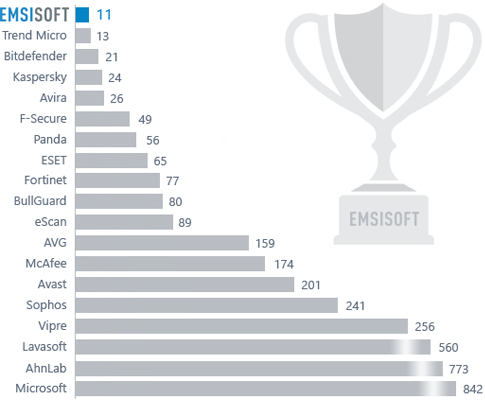 Emsisoft Anti-Malware is very light on resources. Emsisoft Anti-Malware has earned multiple VB100 awards, multiple AV-Test certifications and consistently shows in the upper quarter of all ongoing AV-Comparatives Real World protection and detection tests.